Our FRP Jacketed rod has composite core (FRP core) with PP coating jacket. 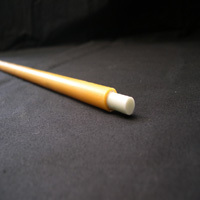 Fiberglass rod has higher strength than plastic rod. The outer polypropylene coating can take up the surface tension when FRP rod is bent and also reduce the friction resistance. 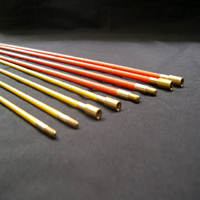 The combination of FRP core and PP coating jacket make our FRP jacketed rod perform well flexibility and high strength that easily insert in complex condition as the best aid for cable pulling. Male end fitting in one side and female in another side for screwing together end to end to the length require. Other dia of the rod and length of each pc can make as request. Pulling eyes are available on request.